�����Dealers are reporting a severe shortage of most bullion products. While the world commodities markets were being tested for recent lows of Gold, Silver, and Platinum, physical products were being bought up as fast as buyers could arrange payment. 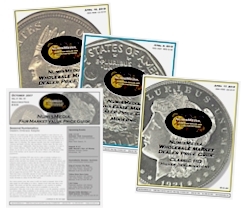 The U.S. Mint suspended production for various bullion coins until prices stabilize, and premiums in the secondary market have sky-rocketed. The premiums for the 2013 Silver Eagles have doubled in the last week. The one ounce Proof Gold Eagle in the OGP is currently trading at $1,675, the premium has increased from $180 to $200 to $250 in very rapid succession. 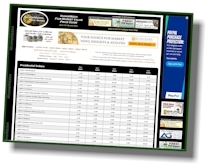 �����Updates for the Moderns Wholesale Market Dealer Price Guide have just been completed with Gold at $1,400 and Silver at $13.25. There is a large amount of declines since our last print update; be sure to check out all the changes, especially in the Eagles chart. Despite the bullion declines there are still many increases lead by the 1995 W Ultra Cameo PR69 now up to $3,500 Market. Also on the rise is the 2001 W Platinum $100 Ultra Cameo PR70 up to $2,375 and the 2006 W Gold $50 20th Anniversary Reverse Proof 70 at $2,850. 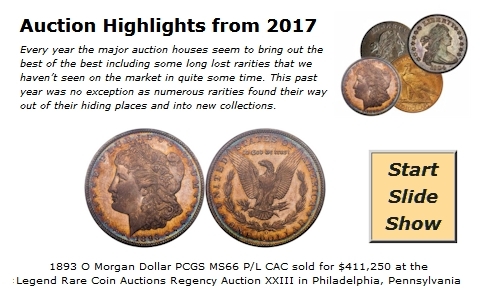 �����As mentioned previously, even with the sharp decline in the metal markets, we have still seen some extraordinary increases to rare date coins. The following list is an example of a few coins rising in price in the past 30 days along with their percentage increase.